Myszyniec, the largest town in the Kurpie region and the regional trade and commercial center of the area, can trace its beginnings to a chapel erected here by the Jesuits in 1654. The Jesuits in Łomża assigned two priests to the chapel, whose mission was to convert the inhabitants of the nearby Kurpian Forest. King Jan III gave the Jesuits permission to clear two “włoks” of land to build a school, tavern and brewery. During the Swedish wars in 1702, the Swedes were defeated by the Kurpian tribesman. 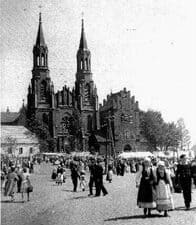 As punishment, the Swedish invaders burned down the entire town to the ground in 1708 including the first wooden church dating from the 1650s. In 1716 Jan Kos, the Wojewoda of Ostrołęka, supervised the construction of a new church edifice. King August II gave permission to conduct fairs at the town’s market place in 1719 and a settlement gradually grew here. Originally the settlement was called Martuny, after a certain tar maker named Martun who settled here after the conclusion of the Swedish Wars. In 1774, the church was granted parish status and was served by diocesan priests. The present church structure was erected between 1909 and 1919 and is one of the largest in the area. . The red brick neo-Gothic church has three naves and features five altars, two of which date from the 18th century. Myszyniec is located on a flat plain on the Rozoga River. In the 19th century it was located in the area of Poland seized by Russia during the partitions of the late 18th century. Administratively, Myszyniec belonged to the Province (gubernia) of Łomża, County of Ostrołęka. It was only a few miles from the border with Prussia. The people inhabiting the town and surrounding villages were and are distinct from other nearby regions in speech and customs. The Kurpian region is known as a major folklore center in Northeastern Poland and the distinct form and characteristics of Kurpie peasant art is visible in the architecture and customs of the region. The territory of the Myszyniec parish in the 19th century was expansive. The parish counted 17,000 parishioners. Newer parishes were carved from the original parish’s land area, in Lipniki in 1838 and in both Łyse and Czarnia in 1884. The villages currently belonging to the parish at Myszyniec include: Antonie, Bialusny Lasek, Browary, Charcibałda, Cieck, Dąbrowy, Drężek, Gadomskie, Gradzkie, Koryta, Krysiaki, Niedźwiedź, Pełty, Stary Myszyniec, Swidwyborek, Wołkowe, Wydmusy, Wykrot, Zalesie and Zdunek. The daughter Parish at Czarnia serves the following villages: Bandysie, Brzozowy Kąt, Cupel, Cyk, Długie, Michałowo, Rutkowo and Surowe. The Łyse parish serves Dęby, Pupkowizna, Serafin, Tyczek and Wejdo. The land in parts of this area is sandy and swampy making efficient farming difficult. At the end of the 19th century the basis for existence and livelihood of most Kurpian families consisted of a 7 to 10 acre farm, in many cases located in a forest clearing. Since families were large, consisting of 7 to 10 members, it was estimated that a minimum of 28 acres was necessary to sustain an average sized family of the era. It is no surprise that by 1914 nearly 20% of the population of the area had departed for the United States, Canada and Brazil. One of their destinations was New Britain. Some of New Britain’s first Polish marriages involved couples from Kurpie. In the first years of the 1890s Mikołaj Nadolny wed Marianna Popielarczyk and Franciszek Brodzik took Marianna Blogoslawska as his bride. Many others were to follow them. A good number of the names of the first parishioners at Sacred Heart Church reflected their Kurpian heritage. Two of New Britain’s mayors and New Britain’s first Polish funeral director traced their roots to this culturally distinct area of Northeastern Poland.